Yardsticks and tape measures have now definitely had their day - Leica instruments have transformed work practices in the building trades. We are very excited to present the new Leica DISTO™ D510, the world’s first ISO 16331-1 certified laser distance meter with digital Pointfinder- ideal for outdoor use on construction sites. Designed for real job site use, the D510 meets tough IP65 certification - dust and waterproof. The Leica DISTO™ D510 features Bluetooth Smart 4.0, enabling communication to the latest Apple iPhone and iPad devices. This is a major step in improving the workflow of anyone that needs to document and exchange data wirelessly from the work site to office. With the integrated digital Pointfinder with 4X Zoom, the Leica DISTO™ D510 easily and accurately takes measurements in unfavorable light conditions. Ask anyone who has tried to measure outdoors on a sunny day – this function is priceless. Even when laser point is no longer visible to the naked eye, the target can be seen perfectly in the crosshairs in the Leica DISTO™ D510 display. Measurement data can be conveniently and accurately transferred using the integrated Bluetooth® Smart Technology. The free app Leica DISTO™ sketch supports the creation of ground plans or tables on iPhone or iPad. Dimensions can even be entered onto photographs with no effort whatsoever. Thanks to the combination of distance and tilt measurements you can determine the horizontal distance simply & precisely without the need to hold the unit level. 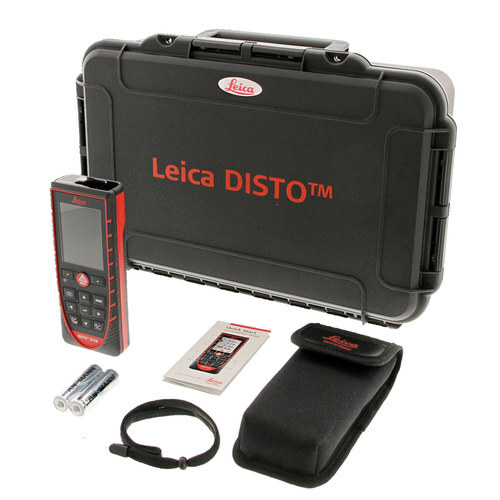 You can take a measurement and the Leica DISTO™ D510 will then automatically calculate the shortest horizontal distance allowing you to measure quickly and easily, even over the top of objects and people. The Leica DISTO™ D510 features a simple function for the measurement of angles of room corners. In three quick steps the angle of the returning wall is displayed to a resolution of 0.1°. The sensitive measuring elements of the DISTO™ D510 are protected by solid rubber parts and a sprung bump system. Proven in drop tests from 2m in height , the DISTO™ D510 is therefore extremely robust. This allows the user to measure the of staircases, disabled access ramps and roofs and with the laser gives you a vertual 200m inclinometer. This means that it is not only possible to measure angles, but horizontal distances too! Combined with the Pointfinder, amazing indirect measurement options are provided. Hence, measurements are possible where no reflective target point is available e.g. when determining the height of a tree or when measuring the height of a reflecting glass facade. These could not be measured with a conventional laser distance meter. Aim the instrument straight at the target point, whether measuring out of corners, slots or from edges: with this endpiece you are prepared for all measuring situations. The instrument detects the endpiece automatically, which helps you avoid expensive measuring errors. Providing the simplest possible operation of complex measuring functions is a must for Leica Geosystems. The Leica DISTO™ D510 has been adapted to the user interface of modern cell phones. Furthermore your favourite functions can be assigned to a pair of selection keys, for quick access with a single button press. This bracket offers the perfect solution for Disto users who wish to take advantage of the remote measurement functions in both the horizontal and vertical axis making it ideal for the measurement of roofs and other difficult to reach targets. When used in conjunction with the TA360 & LSA360 adapters this tripod allows the user to make full use of the pythagorous and tilt functions available on the Leica Disto range of laser tapes.